Online learning is now achieving recognition as offering a way for learning to scale. However we need to learn from the experiences in distance learning institutions. The Open University was established over 40 years ago and offers a unique experience in building a distance learning organisation on	innovative use of media, originally through broadcast, then technologies such as video and DVD, to the current use of online as an integrating element. This paper draws together lessons from how the OU has made use of media and the way it can build learning journeys. Analysis then relates this history to an ecological model that has enabled a resilient and innovative approach that can apply more widely to other organisations seeking to offer online education. "Rather than dealing with each technology in isolation, we would do better to take an ecological approach, thinking about the interrelationship among all of these different communication technologies, the cultural communities that grow up around them, and the activities they support. Media systems consist of communication technologies and the social, cultural, legal, political, and economic institutions, practices, and protocols that shape and surround them. The same task can be performed with a range of different technologies, and the same technology can be deployed toward a variety of different ends. Some tasks may be easier with some technologies than with others, and thus the introduction of a new technology may inspire certain uses. Yet, these activities become widespread only if the culture also supports them, if they fill recurring needs at a particular historical juncture. It matters what tools are available to a culture, but it matters more what that culture chooses to do with those tools." Students enrolling on undergraduate programmes of study with the OU need no prior qualifications in order to gain entry. Access to higher education is thereby available to many people who would find it difficult to gain admission to other more traditional universities. Being an open university, however, does not necessarily involve a compromise of quality in either teaching or research. The Open University is comparable in many ways to other Higher Education Institutions in the UK - the range and depth of the teaching programmes are comparable with other more traditionally structured Universities, and it is subject to the same processes and procedures that ensure quality as every other higher education institution in the UK. It has been in the top three in the national rankings for student satisfaction for teaching since ranking began in 2005. Its research output places it in the top 50 of the UK rankings, with more than half of the research designated 'internationally excellent', and a significant proportion identified as 'world leading'. However, one way in which The Open University does differ from other institutions is that it makes many of its online materials available as Open Educational Resources (OER) free for people anywhere in the world to study, and also to download, to take away, to modify and to make their own, without registering as students. Tools are provided to do this, and also support for the communities as they engage with the materials. One reason why OER is an important aspect of the OU's profile is that its charter commits it to contributing to the educational well-being of the nation. There is a commitment to educating the general public, which has been part of the OU's role since its inception. Thus the OU operates in the public domain, and engages ordinary people in learning in a variety of ways, showing them how it is possible to develop themselves, and to gain more qualifications, whether vocational or academic. This can be cast as creating a journey from informal to formal learning, from watching television to registering for a degree course. The teaching must therefore be effective, easy to access, and appealing to a large body of potential students who may not be familiar with academic work or formal learning. The University is organised around familiar academic disciplines and faculties - i.e. Social Sciences, Arts, Science, Mathematics, Computing and Technology, Health and Social Care, Education and Languages and Business and Law. All courses (i.e. modules) are designed centrally by course teams, typically consisting of academic staff, media designers, editors and administrative staff. A course may have various components that are (i) delivered via the open source VLE, based on Moodle; (ii) web-based (audio-visual, text, interactive applications); (iii) disk-based (DVD-ROM); (iv) paper-based (books, study guides, academic articles, supplementary material) and increasingly by e-book and interactive e-book (i-books). Typically, each student receives a pack of materials and instructions through the post, and for the most part, these same materials can be accessed and downloaded from the web, via desktop, laptop and mobile devices. Students are assigned to a group of other students studying the same course, and this group is tutored by an Associate Lecturer of The Open University. The tutor network spans the United Kingdom and is a strong element of the Supported Open Learning teaching model described below. Whilst the OU conducts research into new developments in technologies to support learning, there is an emphasis on its function for the learner - i.e. what the teacher, or the designer of the materials is trying to achieve and how well students can engage with that learning. Learners are only concerned that the learning outcomes they seek are well served both by the materials, and by the technology deployed to deliver them. This may seem obvious, but determining which technology to use to support such a wide range of potential learners and for what purpose is not a straightforward task. For example, not everyone wants to study for a degree, and not everyone wants to commit to a formal programme of learning that makes heavy demands on their time and energy. SOL is underpinned by a strong socio-constructivist approach to pedagogy (e.g. see Kim, 2000), deriving from the cybernetic models of Pask (1976) in the early days, and the conversational model later developed by Laurillard (2002). There are two important factors that determine how we deploy pedagogy. First, because the majority of our students are in full-time employment and are time-poor, we operate a mainly asynchronous teaching model. Second, as pointed out earlier, many students have non-traditional backgrounds, and are without the study skills of typical school-leavers. They will be learning alone, without the benefit of mixing with and learning from peers, which is why OU students need support from well-designed teaching materials. To address this problem, alongside the support from tutors and effective administrative support, the approach has been to embed pedagogy in the structure of the materials and study guides we provide, cultivating good study habits as we go. In addition, the unique characteristics and affordances of each medium are taken into account, and a carefully designed media-mix for blended learning is created. As a socio-constructivist approach would dictate, the courses seek to exploit opportunities for interactivity and communication between students, using appropriate technologies. From the ecological perspective the SOL model interrelates the components that are needed so that areas that are difficult to address at a distance through human contact become supported by material, while those areas such as feedback that cannot be contained in material become the focus for the human, Associate Lecturer, role. This expertise is further brought together and updated using an institutional approach to Learning Design. The term 'learning design' can be understood in several ways: as a product, as a practice and as a process (Cross et al, 2012a). An explicit design process, in any domain, often leads to improvements because the externalization of the thinking and decision-making processes makes it easier to scrutinize, to share and to critique. It is also easier to incrementally improve courses and teaching if the original design is captured in a form that the organization can preserve and refer back to. Through learning design, the OU is developing models and exemplars that can be shared across the organisation. These exemplars will not only capture what was designed, and why, but will also form the basis for collecting student views and opinions about the course, and performance data as to how well students learned from it, and succeeded in their learning objectives. This bank of exemplars represents the product, or output, of learning design - a repository of stabilized, codified institutional knowledge that can be used as the basis for growth. A second interpretation of learning design is as a set of academic methods to understand how learning design takes place, and how teachers share their practice. The learning design exemplars in the exemplar library will capture best practice that can be communicated and shared amongst design teams. A third interpretation is the focus of the next section, which is that of the design process. What learning design seeks to do is to identify, articulate and share the learning and teaching activities that teachers and learners engage in. Using some fairly simple tools and representations, the design process enables and supports course teams in making decisions, feeding them data gleaned from other designs, innovations in pedagogy and technology, and summaries of best practice. Aside from providing this information, learning design does not tell designers what to do - the tools capture and support the design process. The team records what they have done, and is then able to decide whether or not a piece of teaching they have designed lives up to their ambition when it is measured against other designs, other implementations and other student data for similar courses. Alongside SOL and now Learning Design, the Open University has developed an ecological approach to its use of technology, how the issues of culture around these technologies are scaling up, and becoming increasingly salient at several different levels. The ecological approach encourages holistic solutions where mixed elements are integrated for the learners. This has been the focus of the work of the OU for its formal learning and is also influencing its approach and philosophy applied to informal learning. Technologies for teaching have made major advances over the 40 years of the University's existence. There are some interesting cultural recapitulations in the move from broadcast to interactive learning over the past four decades that mimic the shift that takes place within individuals as they develop from dependent to independent learners. 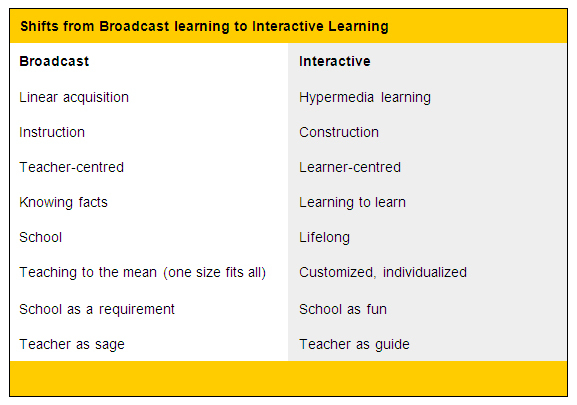 For example, Table 1 illustrates Tapscott's (1998) analysis of the shift from 'broadcast' to 'interactive' learning for schoolchildren between the 1970's - 1990's. The key points to note here are: (i) the shift in agency from the teacher-centred view to a learner-centred view and all that that entails, and (ii) the customisation and individualisation of the learning process, leading to a much more fulfilling learning experience that is likely to go on far beyond the formal setting, becoming a natural habit in people's lives. In a complementary perspective, Table 2 illustrates the changing technologies that The Open University has used to embody supported open learning for adults since our founding in the 1960's. Given that its teaching approach is based on socio-constructivist principles, it has always sought to promote active, independent learning, even when using print and broadcast media, which are often regarded as fairly transmissive in character. For example, the development of in-text exercises for self-assessment was a key feature of Open University printed texts and study guides from the 1960's. In the 1980's the OU also developed guides for students advising them how to watch broadcast television in 'active participation' mode, sitting forward with notepad, rather than sitting back watching passively, in relaxation mode. Once again the ecological principle of providing interrelating media and solutions help remove gaps in provision and avoid the potential difficulties in distance education. Technology has developed rapidly over this 40 year period, and much has been written about how to deploy it in education. The calls for revolutionary change in learning and education based on such new developments have become commonplace in the literature, with each new wave of technological breakthrough (cf the recent impact of MOOCs discussed in de Freitas 2013). But by adhering to the principles underlying its approach to the use of media and technology (i.e. maintaining a focus on what activity students are engaged in at any one time, and defining the characteristics of that activity) The Open University has managed to steadily co-evolve its pedagogy with developing technology in such a way that students benefit from innovations in technology with correspondingly sophisticated innovation in teaching. 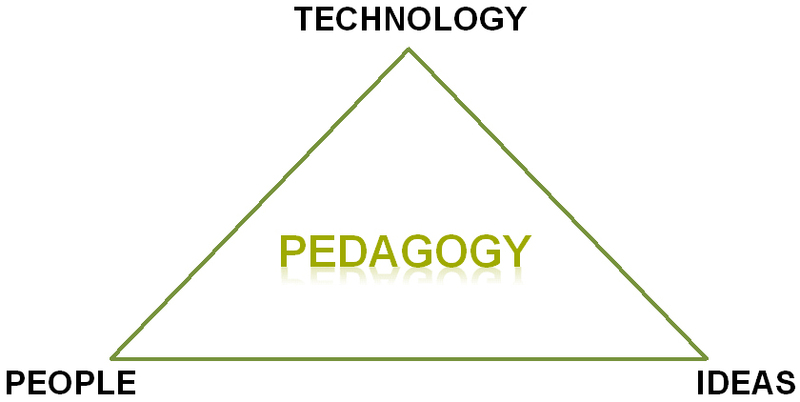 In this way, pedagogy is used as a way of stabilising technology, bringing it into a co-evolutionary relationship with pedagogy, and into the service of people (both teachers and learners), to communicate ideas. By appreciating the complex ecological relations between people, technology and ideas (or knowledge, or content), the OU has learned much about when technology is appropriate, and when it is not. 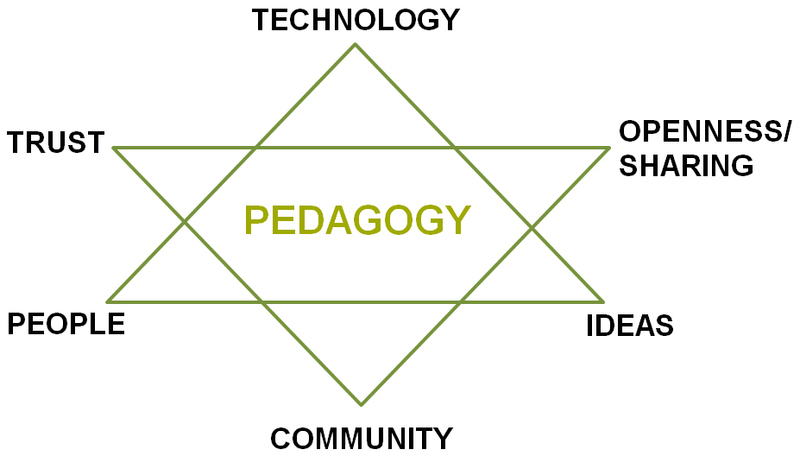 Thus, the pedagogical principles help to hold in tension the people, the technology and the ideas or knowledge being communicated or constructed with students (see Figure 1). This, then, is one element of the concept of ecology that Jenkins (op.cit) describes. It is what constitutes the activities and actions that are designed to lead people towards learning. It is the 'what' that we do for people. Operating as it does in the public domain, without a ready-made supply route from secondary education, The Open University needs to develop in the wider population an awareness of the value of learning, of the benefits that flow from it, and, most importantly, of the ways in which they can be a part of it. The OU needs to make people aware and get them to engage with learning often as route to personal improvement. But eventually, of course, it needs to convert this interest to registration, and then to retain people as students to achieve their goals and emerge from the University with whatever qualification they were seeking. The first challenge, then, is to be sure that the OU presence is known where the mass of people are, with appropriate material that is designed to appeal to different audiences, making learning enjoyable, but always stimulating and sometimes puzzling and challenging. The 40 year relationship with the British Broadcasting Corporation (BBC) has certainly helped in the process of developing awareness in people of the world around them. The BBC/OU relationship was founded on the principles of education for the masses that is at the heart of the BBC's mission, and is still the foundation stone for providing access to learning in people's homes. For example, there were 250 million views of OU programmes (which include radio as well as TV commissions) in the UK last year across wide range of channels and subjects. Working with BBC internationally - especially with BBC World Service - on glossy, high production value programmes like 'Digital Planet' there have been in excess of 1 billion events where someone has sat down and watched or listened to an OU programme. Whilst this kind of programme can achieve broad reach, most of this material is ephemeral - in the past it would have been broadcast and gone, with interested viewers having to wait for repeats to see it again. In the 1980's viewers - or potential students - could record programmes from the broadcast media. Nowadays, with various media players (e.g. the BBC iPlayer), learners have far greater permanence and choice of viewing - with BBC/OU co-productions available to UK audiences for free for extended periods. Pedagogically, though, the programmes are intended to be viewed once through - often strongly narratively driven, such programmes have a grammar that defines the experience, and it is not typically one which makes many demands on the viewer. The OU is keen to find other ways to reach new learners in new ways on their terms. Hence, in 2008 the OU was one of first UK universities to join iTunesU. Like the BBC iPlayer this is a free service, and provides high quality content - but unlike iPlayer it provides access to an international audience and all the content stays up permanently. The OU has added many hours of materials- across subjects as diverse as the history of art, cosmology, Buddhism and quantum mechanics. The appetite viewers have for this material is reflected in the fact that the OU is consistently in the top 3 or 4 downloads of most subject categories - and nearly always featured in the 'Pick of the Day' slot - alongside Yale, Harvard and MIT. With over 64 million downloads (August 2013) - averaging about 85,000 downloads a week (August 2013) -the OU is clearly hitting a market, and more than 80% of those users are coming from outside of the UK. The material on iTunesU is derived from our teaching material, and therefore has a more substantial pedagogic basis - it may be denser, more challenging and more demanding on the reader/viewer. It is all still very high production value material, and unlike a lot of other suppliers to iTunesU, the OU is not just recording lectures. The materials are well designed, well crafted educational 'TV', complemented by a growing range of interactive applications. For many years the OU sent out physical microscopes in boxes to students, but now they have developed interactive microscopes which allow users to look at virtual slide samples on their computers, and most recently as an iPhone app to allow them to look at slides on their phones, while out on geology or botany field trips. These apps can be made available across the world. High on the pedagogy scale doesn't have to mean dense and difficult, though. In addition to iTunes, the OU also has its own podcasting site and YouTube channel. Across these media, the OU has been experimenting with making tasters to initiate people's interest. One of the 30 second clips has exceeded 0.7 million views and made YouTube's main site pick of the day. And the content is free - not just linear AV media - but text and interactive materials like the microscope and data as well. So one challenge is to get into spaces and places where users and potential students are already browsing. But the OU has also created a destination site of its own, aggregating free content into one learning space called OpenLearn (http://www.open.edu/openlearn/). This project, initially funded by the Hewlett Foundation, is one of largest free open educational portals for higher education in the world. Over the last seven years it has delivered over 8000 hours of study materials from existing course provision, and has had over 30 million visitors, 90% of which were new to the OU, and more than 50% from outside the UK. This content is licensed under a Creative Commons Non-Commercial license, which means it is for any users to download, to exploit and share in their own educational context. An important challenge with this open and outreach content is to turn interest into active learning. A key approach here has been to find the 'hook' - the quantum, the smallest unit that can act as a stimulus, giving the OU a way to make an impact in people's busy lives. Sometimes it can be quite a small offering - for example, all of the BBC co-productions have a 'call to action' at the end, a trail that tells viewers about something they can send for, an activity pack, perhaps, or a wall chart; or gives them a URL for an exhibition, or an activity they can engage in to follow up on the programme. The question here is not how many people take up the offer, but how many of those are now 'hooked' which can lead to more substantial activity. As described earlier, the organising role played by pedagogy has helped the OU use media to increase levels of interaction, and stimulate participant autonomy. The rise of social media such as wikis, blogs, tagclouds, Web 2.0 applications and most recently Massive Open On-line Courses (MOOCs), has presented a great opportunity for engaging the general public in learning, and for leading them on through the learning journey. For example, in collaboration with a large scientific consortium in the UK (Open Air Laboratories - OPAL), funded by the National Lottery, the OU is encouraging people to look at biodiversity in their own back gardens and yards, and to identify what they can see using a system called iSpot (http://www.ispot.org.uk/). Here users can upload geo-tagged pictures, identify nature 'spots' and identifications, discuss what they have found and share the data, both at national level, and with others in their area. Experts are available on the site, and as the user contributes more and learns more, they can earn points. This builds their standing and reputation in the community, and they may find themselves advising others who are just starting out. There are plans to re-develop the basic iSpot system to cover other areas such as climate change, and national heritage. The key point is that, in developing such applications, the notion of community is taken seriously. The structure of the community is important, as are the markers for esteem and recognition. These cultural elements make the community work and it then provides an enriching and valuable experience that people will come back to use it again. Hoping that communities will spontaneously form around applications with no support, no seeding and no structures is misguided. Taking the ecological perspective, it is this opening up to community facilitated by the internet that has the more significant impact on learning, rather than the easy access to content. By providing alternative relations leaner-learner and learner-tutor new pedagogic structures are becoming possible that have different dynamics and ways to scale. But his key observation is that interactivity is a property of the technology, while participation is a property of culture. In today's technological milieu, this observation is very helpful. Many educators have confused technology and pedagogy, and technology (as pertaining to machines) with media and people. The example of iSpot illustrates that by moving people progressively through participation in a fairly relaxed and easy activity, they are encouraged to go just a little bit further by asking questions such as: If you've found one, can you find another? Look what everyone else has found - can you match that? Have you got any of these in your back garden? And, of course, somewhere along the learning journey they can take a manageable OU course which will act as an introduction to formal learning, and university level study. Informal learning can potentially create problems for learners who may have been brought up to think that the only learning that 'counts' is formal learning. If they are to achieve anything, they have to move from passive consumption to active participation, from taking what they are given to personalising, editing, modifying and creating. The ways of engaging in social learning these days may be very different from what people educated in more traditional ways are accustomed to. The shift from closed to open learning and from solitary working to sharing may seem quite alien. This paper has outlined The Open University's approach to learning in both the formal and informal domains. An account has been given of how the approach to pedagogy and technology has developed over the past 40 years to arrive at the processes of Learning Design currently deployed, and the use of open media to engage prospective learners, as well as to provide additional motivation and engagement for registered students. Pedagogy and technology are a potent mix, but adopting an ecological approach to their development is important, within a designed process (learning design) so that the benefits of both can be realised. Figure 2 illustrates an enhancement to the simple pedagogical triangle identified in Figure 1. The Open University is exploring and exploiting the interstitial spaces between people, technology and ideas to examine openness and sharing, the development of learning communities and the cultivation of trust within that space. Learning design helps the University to connect developments in teaching with quality enhancement processes that provide the necessary feedback to evaluate the innovations on each presentation. This kind of incremental layering of enhancement and improvement is an essential counterbalance to the more disruptive, radical change (and hopefully improvement) that can happen from time to time, triggered sometimes by the market, and sometimes by technology. There are, of course, some technical innovations which need to take place irrespective of pedagogy - for example, those associated with faster processing, more appealing visual design, better accessibility and usability, etc. However, such developments still need to be co-ordinated through learning design to establish priorities, fitness for purpose, and to ensure there are no unintended consequences for students. The OU, like all institutions in higher education, is experiencing a time of turbulent change not only in terms of the technological developments which enable almost any form of interaction imaginable, but also in terms of pedagogical approaches. Indeed, some of those combinations of pedagogy and technology (such as those seen in MOOCs) are touted as threatening the structure of the tertiary education system itself. It would be easy to get carried away by the hype and the marketing. The thrust of this paper is to emphasise that the design process, building on established expertise and experience, yet incorporating innovation and change, is critical to ensure a coherent, satisfying, yet challenging experience for students. By holding technology and pedagogy in co-evolutionary tension, the OU seeks to ensure that it can provide excellent learning experiences for its learners across the spectrum from formal to informal learning. Many grateful thanks to Andrew Law, Patrick McAndrew, Martin Weller, Ann Jones and to everyone at The Open University upon whose work this paper is based. Laurillard (2002). Rethinking University Teaching: A Framework for the Effective Use of Learning Technologies, 2nd ed. London: Routledge Falmer. Pask, G. (1976). Conversation Theory: Applications in Education and Epistemology.Amsterdam and New York: Elsevier.